With the recent additional tax I had to pay, it prompted me to find ways to reduce or better still pay no income tax at all. Currently I only submit rebates for books, computers and life insurance and evidently it is not sufficient for me to be tax free. I can't share all the 26 tips in respect of the publication. However to highlight a few from the article, I've just recently learned that tax rebate for books are now at RM 1000 instead of RM500. I also found out that we are entitled for RM300 rebate for sports equipment and the high 1 to 1 ratio of Zakat rebate. Others are on medical, life insurance, company car, EPF contribution and education to name a few more. 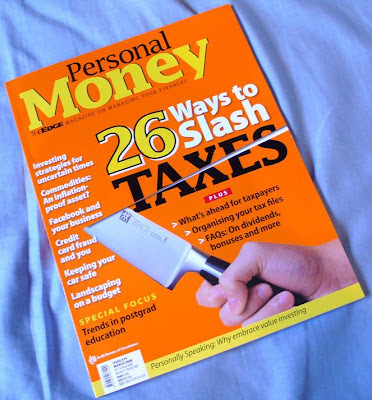 Note: For full details, check out "Personal Money" March edition. section E dalam form tu yang paling penting. because ALL under that section is 1 to 1 (zakat, PC & levi). that portion will have big control on which group you going to fall under (refer 'jadual cukai'). you fall under F, then it's 13%. see how much is the gap in between groups? 3,(+4) 7, (+6!) 13.
i've been trying to make my way so i fall under group E every year. F group pon.. dah tolak macam2 pon... sipi2 je.. skang... not even F!